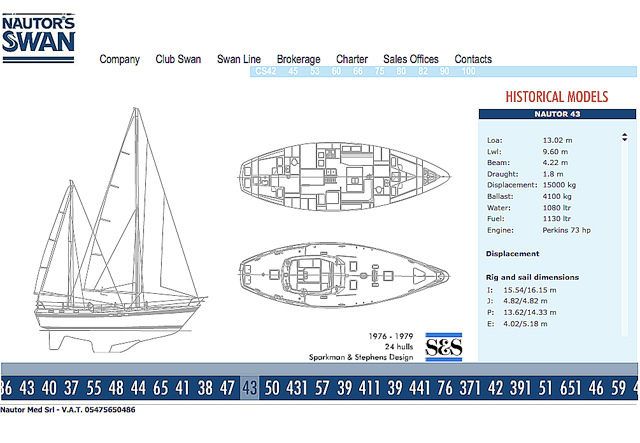 Design Sparkman & Stephens, 24 yachts were built 1976-1979. (hulls ## 0013, 0022, 0023, 0024). 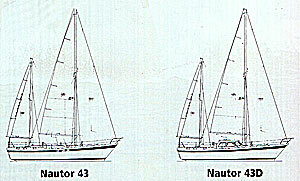 Click here or on the drawing for a screen shot from the HISTORICAL MODELS section of the web site of Nautor's Swan. Standing rigging of 1 x 19 stainless wire with Norseman terminals and double lowers. Antifouled area: approx 41 m² 440 sq.ft. Drained anchor well forward with LPG stowage. Deep cockpit locker P side. Aft cabin with single and double berth. Settee berths in saloon, two berths in fo'c'sle. One head aft P side, one forward SB side. Galley with 3-burner LPG stove P side, double sinks inboard. 120 ltr refrigerator and 100 ltr freezer, both top loaded. Borg-Warner hydraulic rev./red. gear 2.1:1, fixed 3-bladed propeller, 22". 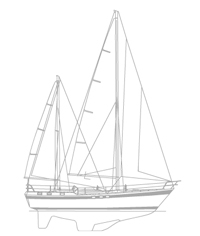 Range under power 1.100 nm, or 157 h, at 7 knots (7 ltr/h). Range under power @ 1.800 rpm 1.880 nm, or 376 h (3 ltr/h).